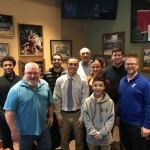 The Hastings Rotary Club has named Hastings High School senior Amar Thomas as Student of the Month for November during a recent meeting of the Rotary Club. Amar serves other students and the school community as a Peer Helper, member of the Diversity group, student aide with special services, and student liaison with the school board. He is also a successful student athlete participating in football, wrestling, and track and field. According to a nomination testimonial submitted by Davis Gooch, “Amar is one of those students that staff members instantly think of when we need a student to help out.” Amar plans to attend college next year, although he has not chosen a school yet.